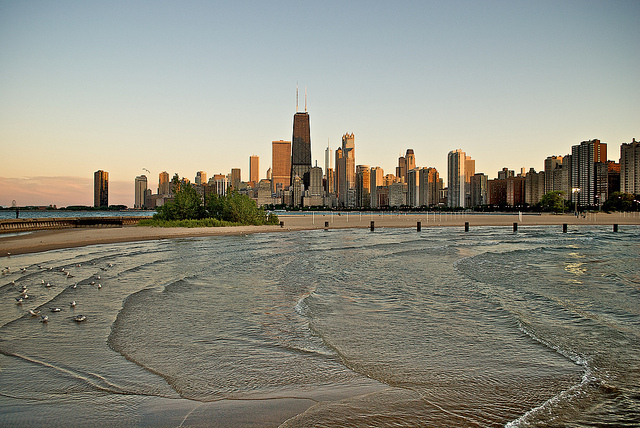 Cities like Chicago have local "climate action plans" to prepare for extreme weather events. Photo by Monika Thorpe. “Transit is the best mitigation strategy for climate change,” said Projjal Dutta from New York’s Metropolitan Transportation Authority (MTA) to start his discussion on how the agency is adapting to recurring, extreme weather events, during a recent Federal Transit Aministration workshop in Arlington, Va. Though national-level rhetoric may be inconsistent on the topic, the reality is that transit agencies are on the front line of extreme weather events. Preparing for these increasingly more common events has become part of regular planning efforts for municipal agencies. The FTA’s two-day workshop, “Getting on the Right Track: Real-World Approaches to Climate Change Adaptation,” was aimed at bringing transit professionals together to discuss how climate change directly impacts transit operations today and how we can prepare for the future. Participants included representatives from the public and private sectors. They discussed both the impact of extreme weather events and how agencies can move from a reactive to proactive response. In a risk assessment workshop, experts discussed four main climate events: increased frequency of heavy precipitation, drought, high winds, and coastal flooding. Transit agencies are accustomed to dealing with these events, but climate change means an increased frequency of these extremes. Geographical location is an important factor in the intensity of events, in determining if the risk is a near-term or a long-term risk, and in developing appropriate responses. The discussion resulted in the idea that near-term risks can be addressed through operations and maintenance planning, while long-term risks require integrated land use planning, capital planning and reconsidering current assets. One of the main ideas that came out of the workshop was flexibility. Heat and precipitation are likely to be two of the largest problems in the near term. Many American cities have light rail or metro systems, which are not easily changeable. In extreme heat, rails may buckle. With high precipitation, many subway or light rail systems will flood more easily, at least to the point of reduced operations. Bus systems and above-ground bus rapid transit (BRT) systems can adapt their operations more easily and often have raised platforms, though they will still have to deal with issues like air-conditioning. Workshop participants stressed that all modes need to be assessed by their contribution to greenhouse gas emissions—the source of the problem. The workshop introduced the FTA’s transit climate change adaptation assessment pilot projects. Taking a more pragmatic approach, FTA’s adaptation projects are less focused on detailed climate science or developing new modeling tools and more about learning from the already successful lessons and exploring potential solutions that could be scaled up nationwide. Mainstreaming climate change adaptation into day-to-day practice could lead to better planning, and consequently, greater social and economic benefits. The purpose of FTA’s pilot projects are to understand the economic costs of extreme weather conditions,the thresholds, the most appropriate adaptation strategies and the way to incorporate them into daily work and apply them to other localities. The seven pilot projects funded by the FTA are in Chicago, Atlanta, Los Angeles, Seattle, Houston, San Francisco and Philadelphia. Six transit authorities presented their most current work. The research pilots are usually comprised of two parts: investigation and strategies. The investigation process aims to identify transit assets and their vulnerability to various types of local weather hazards. The strategies explore the regulatory actions to address these challenges. Cities with local climate action plans, such as Chicago and Los Angeles, are taking a more comprehensive approach to assess the impact of different extreme weather events and how to integrate them with the climate action plan. Other projects apply a more narrow scope to find more nuanced results. For example, Philadelphia is only looking at one metro line and the detailed costs of climate change, including time wasted by people. Atlanta is focusing on how decision making in asset management could respond to climate change. To find more information about this workshop, click here. To learn more about FTA’s adaptation initiative, click here. This post was co-written by EMBARQ Research Analyst Erin Cooper and Research Assistant Heshuang Zeng.